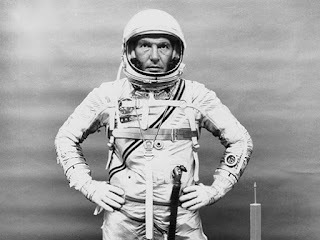 Wally Schirra, one of the original seven Mercury astronauts, died Thursday and I am truly sorry to see him go. He's not one whose name leaps to mind; whose does, other than John Glenn's and Neil Armstrong's? But on 2 occasions at least Schirra helped save the space program. Everybody with a passing interest in space knows that John Glenn was the first American to orbit the earth. There were some glitches -- particularly when it seemed his heat shield had come off -- but he landed safely and received a gigantic hero's welcome. But the next flight, Aurora 7 piloted by Scott Carpenter, was rocky: the cooling short-circuited, maneuvering fuel ran low, the re-entry system malfunctioned requiring Carpenter to fly his ship down manually, and splashdown was 250 miles off course. For 40 long minutes no one knew if he'd made it or not, until he was finally located by the Puerto Rican Air National Guard. Although Carpenter proved a man could take over successfully in a crisis, his flight also brought home the risks of space travel. NASA needed a flight to show that they were making progress in mastering the dangers of space. That's where Wally Schirra came in. Calling his flight Sigma 7 (after an engineering symbol) Schirra made sure his was a textbook flight. Nothing more serious than the urine collection hose malfunctioned, and after 6 flawless orbits he splashed down in sight of his recovery vessel. He became known as "The Textbook Astronaut" from then on. Five years later, on January 27, 1967, Schirra's friend and fellow Mercury astronaut Gus Grissom burned to death in the infamous Apollo 1 fire, along with Ed White and Roger Chafee. NASA had been pushing too hard and took too many shortcuts in our headlong drive to reach the moon by 1970. The space program ground to a halt while the Apollo capsule was overhauled and congressional hearings questioned whether the whole thing shouldn't be cancelled. When the program restarted with the Apoll0 7 mission in October 1968, The Textbook Astronaut was in charge of the mission. And he ran it with a rod of iron, even getting testy with Mission Control when he thought they were pushing things too hard. Although all 3 astronauts developed headcolds, this 11 day "shakedown" mission was a resounding success. Schirra, Don Eisele, and Walter Cunningham put Apollo through its paces, practicing vehicle docking procedures and repeatedly firing the all-important engine that would return moon-bound astronauts safely to the Earth. 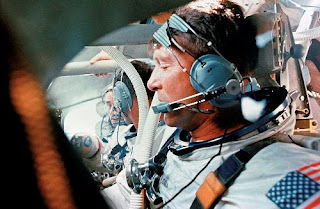 After he retired, I remember Wally Schirra providing expert commentary for Walter Cronkite throughout the Apollo moon missions -- especially the night in July 1969 when humans first pressed a booted foot into the powdery lunar dust. Even the cool-headed Textbook Astronaut had moist eyes that night. I also remember him doing TV commercials for the trusty Actifed he and his crewmates had turned to when they were battling those nasty space headcolds. Farewell Captain Schirra. We will miss you.